These words are wrapped in contrast, very much the same way that Cape Town is a city of contrast. The inner city is awash with tall buildings and colourful signage that stand as testament to a bustling economy, yet as you move outward towards the townships and the Cape Flats you see the flip-side of that coin; communities huddled together under tin-roofs trying to make ends meet. Yet, as you drive through the rural areas or the city bowl, one thing is as common as the wind; the art. 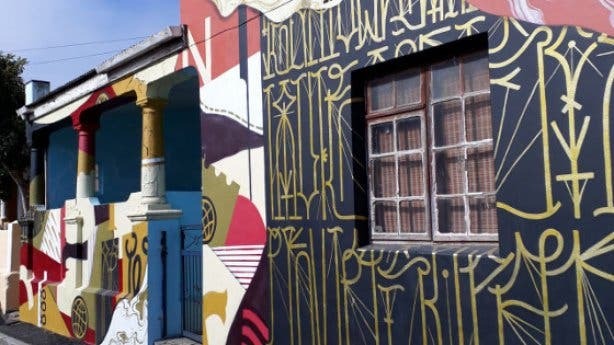 Looking at the street art you can clearly see graffiti in Cape Town is as contrasted as the city itself, and it loves it that way. No matter where you go in Cape Town, there are flat surfaces awash with colour and swirly lines. 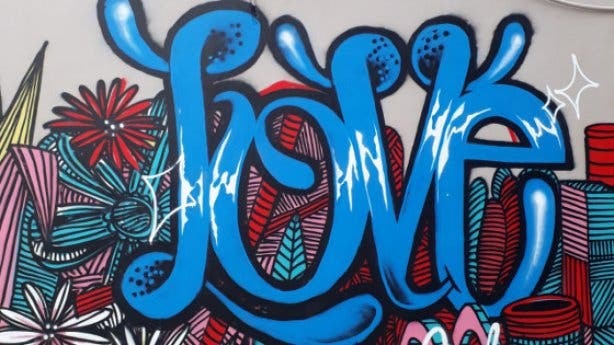 Some of these lines are name tags, some are scribbles acknowledging that 'LV hearts JD 4eva', and some are masterful pieces of expression that the artists prefer to share with the entire city community. It’s an expression of social cohesion; art for everyone. That is, after all, why they created them on a wall in Lower Church Street, rather than a canvas in the National Gallery. 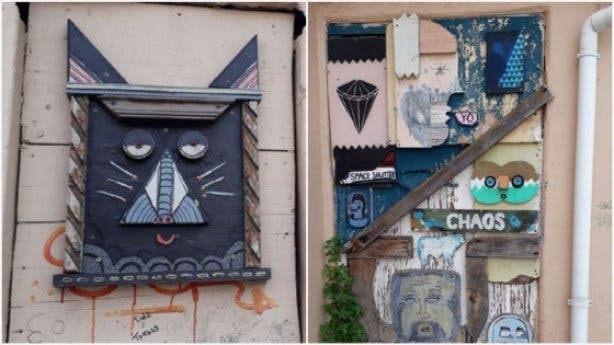 Some may think that street art is scribbled by mischievous kids looking for attention, and for the inner child of many artists that may be quite right, but this yearning for attention is not just to entertain anymore. It has become a powerful tool for urban communication, a way to make people stop and think. 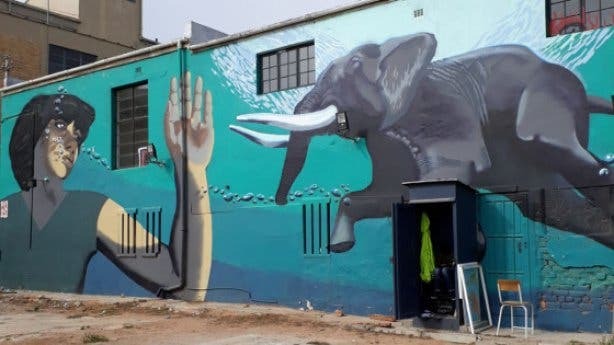 This is captured in the works of one of Cape Town’s most well-known artists, Faith47, who uses her medium to convey messages of our social conscious. Her works are being shown at exhibitions around the world, but you can see a lot of her pieces around Cape Town and Johannesburg, including the Freedom Charter series. This collection of works takes its inspiration from the Freedom Charter, which ensures a safe, secure and non-racial South Africa for all who live in it. 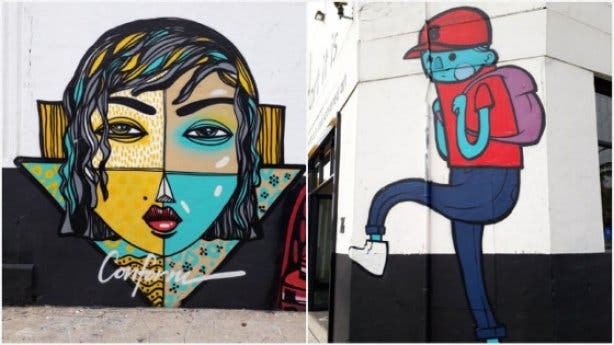 Highlighting the social injustices is common-place for many street artists in Cape Town, but some, like Freddy Sam, prefer to focus on bringing out the beauty in all of us. His pieces make people look deep inside themselves in an attempt to make them see their inner beauty. Many of his pieces are a masterful mix of emotions, colour and ideas. One of his pieces, situated in Woodstock, touts 'Removing the greyness from the soul of the city is the job of musicians, artists and poets.' Another is awash with diamond shapes and a portrait of a young boy and carries the text 'We are beautiful here'. Freddy Sam is also a very well-known organiser around Cape Town through the gallery he founded in Woodstock called '/A word of Art'. He’s also done a number of collaborative pieces with artists doing residencies at the gallery. You can see them all around Woodstock, or you can visit the gallery at the Woodstock Industrial Centre, 66 Albert Street, Woodstock. 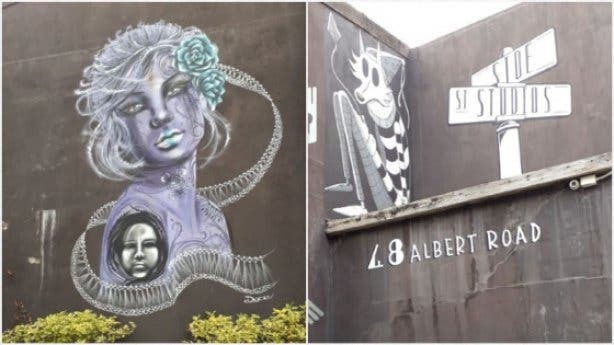 A popular trend for street artists in Cape Town is to share their beautiful pieces with underprivileged youth, and use this art-form to enhance their daily lives. This can be seen by the numerous non-profits around Cape Town that have received 'NGO Upgrades' from artists. Using their art they turn dull homes for less fortunate children into beautiful places of inspiration and growth. Visiting Percy Barley House in Woodstock, a home for troubled youth that teaches life skills, you’ll find an amazing piece of work. This was commissioned by Ogilvy South Africa, and the project was undertaken by some of the best names in the Cape Town scene, like Freddy Sam, Coe:one, Faith47, Black Koki, Fuzzy Slipperz, 351073, and more. Artists are always looking for ways to expand themselves and their works, as seen in FalkoOne’s Splitpieces®. A Splitpiece is described as 'a symbolic contrast of environment and a mural'. It takes an image and divides it into multiple sections, each one of which is created in a location 'different' from the previous. Each section still remains a stand-alone piece, but joined together they collectively create the original image. His images are visible around Cape Town and Johannesburg, and he recently even went to Darling to create more Splitpieces. Street Art is very much alive and well in Cape Town. It is changing and evolving as much as the city itself is. Every day there are new pieces and new artists coming into the scene, bringing along with them new ideas and styles and thanks to Cape Town’s prominent placement in the world creative space, numerous international artists are paying our fair city a visit to share their visions. So do yourself a favour and take a drive around the city, there’s a wealth of art to be discovered between the cracks in the contrasts. Jaco Slabbert is a social entrepreneur that runs a guerilla marketing enterprise, focusing on creating social change through art and media communications. To stay in the loop on what’s happening in and around Cape Town, be sure to subscribe to our popular newsletter and follow us on Facebook and Twitter.